A Polish woman shot dead when she walked into a gunfight was talking to her sister on a mobile phone as she was hit, the BBC has learned. Magda Pniewska, 26, was caught in the cross-fire between two gunmen in New Cross, south London, on Tuesday. Three men and a woman were arrested and a red Volkswagen Polo car recovered. One person has been bailed to return to a police station pending further inquries. Three have been released with no further action. Miss Pniewska died from a single bullet to her head. 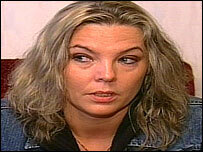 She was having a phone conversation with her sister Elzbieta Luby as she was shot. "The mobile was still working," said Ms Luby, speaking from the family home in Poland. "I was calling her. At this moment, I heard another two shot guns and one more time... and then nothing. After that, nothing at all, the mobile was switched off." No weapon has been found but police are scouring CCTV footage in the hope the gunmen were caught on camera. 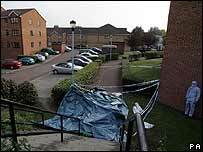 Ms Pniewska was found fatally injured outside Stunnel House in John Williams Close, near her home. She arrived from Poland four years ago and had been living with her boyfriend while working as an activities co-ordinator at the nearby Bupa-run Manley Court nursing centre. A statement from Ms Pniewska's family said: "Our darling daughter, the flower of a rose and a ray of sun, has been taken away from us. "My darling sister whose joy and wisdom has been taken away from me. "My darling creature whose happiness and dreams have been taken away from me. "Today she is not among us anymore but her spirit still lives among us and our memories of her will never die." Detectives are investigating whether the shooting was linked to drug dealing on John Williams Close. Witnesses said up to five shots had been fired in quick succession. 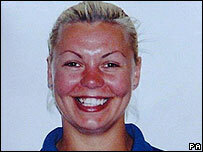 Det Ch Insp Tony Boughton said Miss Pniewska was "an innocent woman caught in the cross-fire". He believed shots were exchanged between a man in a parked red Volkswagen Polo and another man standing at the top of some nearby steps. He said: "Miss Pniewska was making her way home and this would have been a normal route across the car park, up the steps and home. "She had finished work and had got caught up in the cross-fire." Mr Boughton said the red Volkswagen Polo was later found abandoned about one-and-a-half miles from the scene. He had no details of its condition, but said it was undergoing tests by forensic scientists. London mayor Ken Livingstone has called for replica guns to be made illegal following the shooting. "I feel absolute outrage, because nobody in London should be carrying guns," he told BBC London. "And now almost half the gun crime in London is people who've bought a quite legal replica gun and spent an afternoon making adjustments that allow them to fire. "I just think to be absolutely clear, all these should now be banned."